It’s safe to say that most people consider medium-format photography confined to high-end professionals or studio photographers with an income and range of supporting kit suited to get the most out of the cameras. Prices for models from the likes of Hasselblad and Phase One can easily reach five figures and upwards, and when you consider the further investments in supporting kit needed are placed well out of the reach of most. Pentax, however, has been looking to address this in recent years. In 2010 it launched the 645D – a medium-format camera that came in at well under £10,000 at launch and thus was just about within reach of the average professional landscape or studio photographer in need of the highest resolution going. 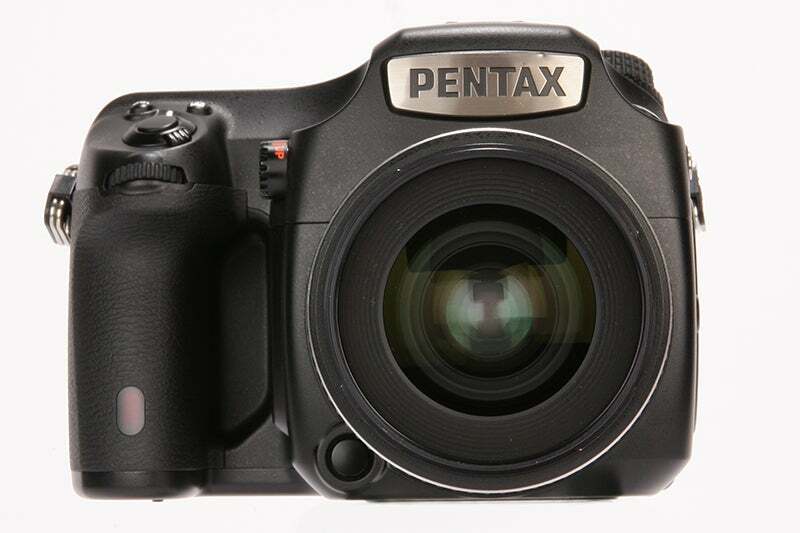 The 645D is now joined by Pentax’s latest medium-format addition, the new 645Z. The model retains the same physical size medium-format sensor but ups the resolution even further – now sitting at 51.4MP. It’s also even cheaper than its predecessor, coming it at under £7,000 body only. That still makes it a lot more expensive than most DSLRs, so has Pentax done enough to tempt DSLR users to make the switch at the extra cost? There’s no denying that the core feature of the 645Z is its sensor, and as such it’s sensible to take a closer look at the chip. The sensor is the same as seen before in the 645D, measuring in at 44 x 33mm. This delivers an equivalent focal length multiplier of 0.8x, thus turning a 100mm lens in to an 80mm in 35mm equivalent terms. Although the sensor is the same in terms of dimensions, there are in fact several key differences. To begin with there’s the resolution – this has jumped from 40-odd megapixels on the 645D up to 51.4MP, and thus will be capable of resolving a stunning amount of detail. As if the 51.4MP resolution wasn’t capable of resolving enough detail, the 645Z also dispenses of its AA filter. If you have any issues with moire patterning Pentax’s AA filter simulator is on hand to help you out. Another key difference is the technology of the sensor itself – while the 645D relied upon CCD technology, the 645Z utilises CMOS technology. What this means in real terms is that the new sensor benefits from a massive increase in ISO range – while the 645D featured a relatively restricted ISO range of ISO 100-1600, the 645Z covers a huge ISO 100 – 204,800. This increase in ISO range means that the 645Z is much more versatile and therefore well at home away from its traditional studio and landscape environments. 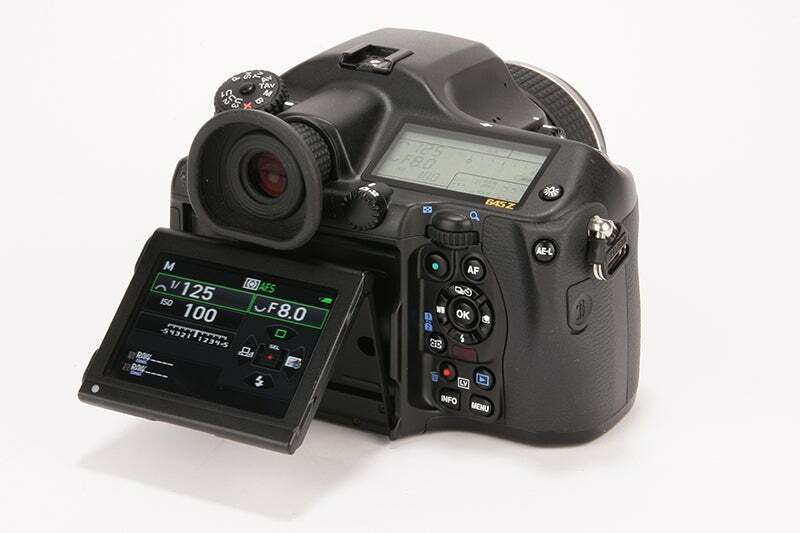 On the rear of the camera sits an attractive and well-specified 3.2in, 1.04-million dot LCD screen which is tiltable. This’ll no doubt appeal to landscape photographers who are used to working at awkward angles on tripods in pursuit of a unique perspective. 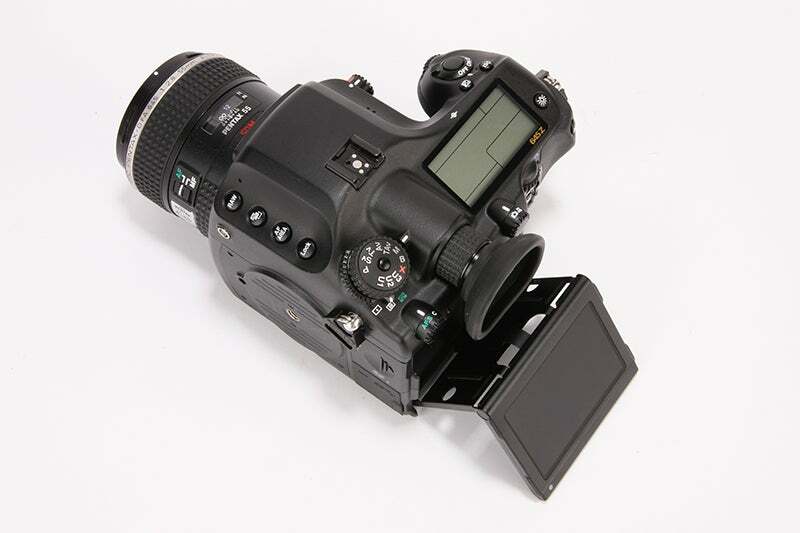 The LCD screen is paired with an optical viewfinder which provides a 98% field of view and 0.85x magnification. One welcome feature of the 645Z is its compatibility with Flucards – SD-sized cards which support Wi-fi connectivity for the camera including wireless file transfer as well as remote camera control on either smartphone or tablet. While there might be a few significant changes in terms of the camera’s feature-set, in terms of design there’s very little to pick from between the 645D and 645Z. In terms of the general layout of the controls, the various dials and buttons are all in identical locations. 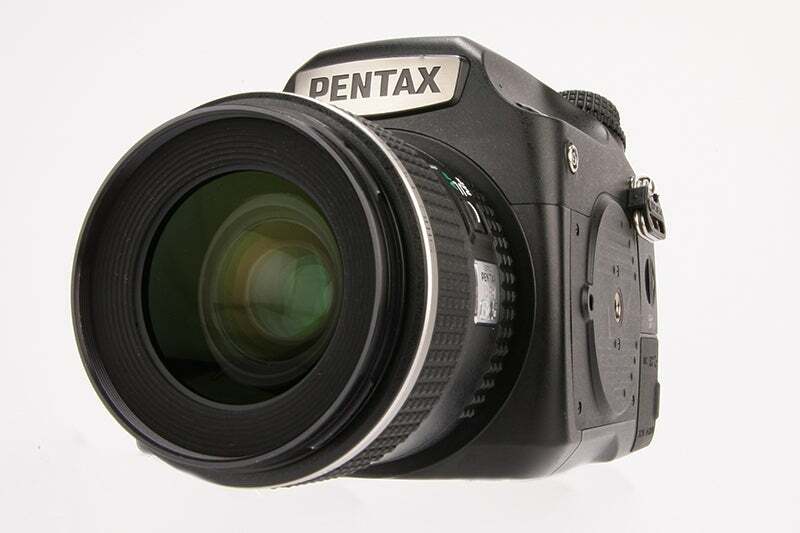 The good news is that despite the professional level of the 645Z if you’re familiar with how a Pentax DSLR works then you’ll have no troubles in getting the results you want from the camera. One necessary observation of the 645Z is that it’s certainly a large camera. It weighs in at nearly 1.5kg body only, and when you consider the extra weight that a few lenses in the kit bag will bring you start to get the idea that it’s a weighty package. That being said, it all fits easily enough in to a medium-sized shoulder bag while to be fair it’s not a huge amount heavier than comparative professional level DSLR gear. One new modification to the camera is a slightly redesigned hand grip. That on the 645Z is slightly larger and deeper than on the 645D, and as a result it gives a more secure hold over the weighty body and lens. The good news with regards to the camera body is that it boasts some 76 weather seals, while there’s also a series of weather-sealed lenses also available. These will no doubt give the professional landscape photographer the confidence they need to take the 645Z out shooting no matter what the weather might through at them. Much as the camera is designed in a way so that it handles like a traditional Pentax DSLR, the same is true in terms of the cameras performance. In fact, during the time spent testing the 645Z it would have been quite easy to forget that you were actually shooting with a medium-format professional level camera. For example, considering the size of the shutter the 645Z features you could be forgiven for thinking you might hear the clamp of it as you shoot. However, although it’s not a completely silent operator it’s still not a huge amount different to a standard Pentax DSLR. While the 645Z certainly doesn’t sport the fastest AF set-up on the market, it’s no slouch. The model features 27 AF points – 25 of which are cross-type – and these offer a comprehensive enough coverage for landscape and studio photographers alike. One point of note with regards to the camera’s performance is the pressures of having such a high resolution sensor. When shooting it’s almost imperative to use a tripod, especially if you’re shooting at the longer focal lengths. If you don’t, even the slightest amount of camera shake will be highlighted. There’s no escaping the fact that the 645Z is all about resolution. Its 51MP sensor is capable of resolving an extraordinary amount of detail, outresolving most professional level standard DSLRs. Even as you move the camera up through the ISO range, it still captures an impressive amount of detail. At the lower ISO settings the 645Z produces impressively clean images, retaining this performance up to ISO 3200. Noise does become more evident as you head up through the range, at 12,800 appearing gritty and at 51,200 luminance noise being particularly pronounced. Another benefit of the large medium-format sensor should be an impressive dynamic range. The good news is that this is the case, and the dynamic range on the 645Z is the highest of any we’ve tested at around. This means you’ll be able drag a huge amount of detail out of shadow areas and preserve detail from areas of extreme highlight as well. A camera such as the Pentax 645Z is unique in that you have to adjust your workflow to get the most out of the camera. The large body and huge resolution means that you find yourself taking your time to get the shot you’re looking for, and if you don’t you’ll find the camera biting back and magnifying any imperfections. However, if you are willing to put the effort in you can get some truly impressive results that are well worthy of the high-end professional market at which its intended, and with that in mind it certainly represents good value.